Date: 27 October 2014. 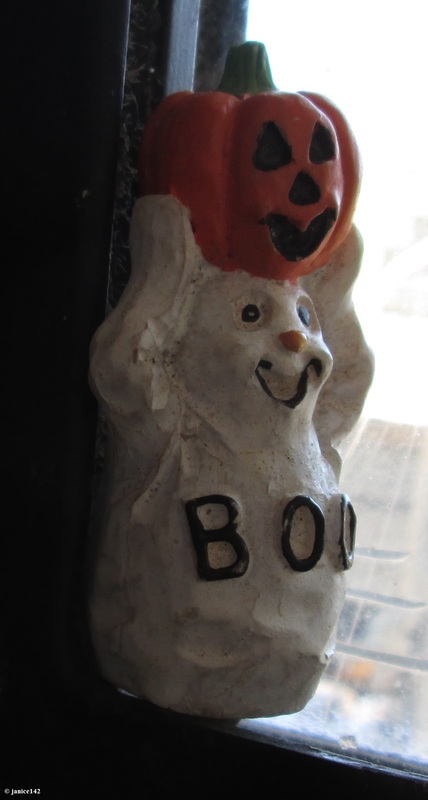 Spook-tacular circa 2014. As many of my friends know, I love the holidays. Starting when the Christmas decorations hit the stores (before Halloween for goodness' sake!) and on through the winter, this is by far my favorite time of the year. And for the record, my Christmas decorations don't go up until after Thanksgiving. In the meantime, Halloween is first in the autumn line-up and Seaweed is becoming Spook-tacular again. Halloween aboard Seaweed isn't fancy, but it is fun. Though my Seaweed may be smaller than the normal home, it is filled with spirits. Some are familiar from previous Halloweens. 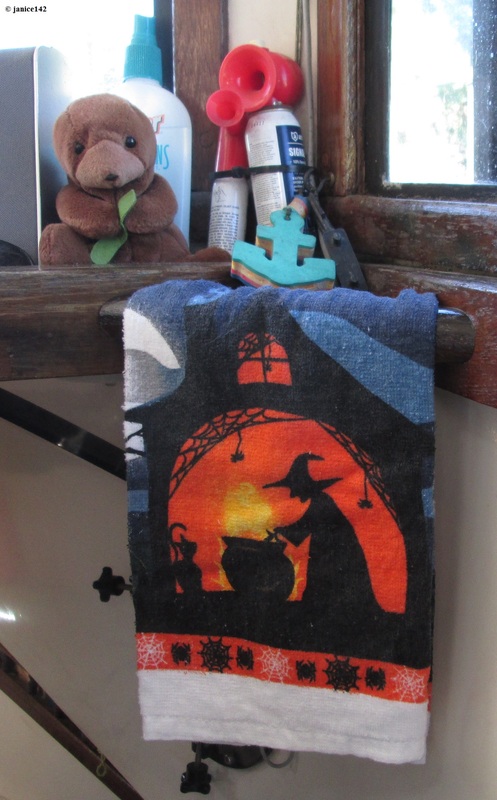 The witch towel (above right) is a new purchase. I've hung it on a hand hold into my cabin. Side Note: When living aboard a boat, you'll begin to notice specific spots that you'll reach for to balance yourself. Remember those places and find a way to make a hand-hold right there. That is why Seaweed has so many more than most boats. I want to be safe! The cat was from one of those ten cent bins after the holidays at Hobby Lobby. Stained with red oak (thanks to Sweet Thing aka Marsha on S/V Freebird) and varnished, she tucks up high by the doorway to the cockpit. 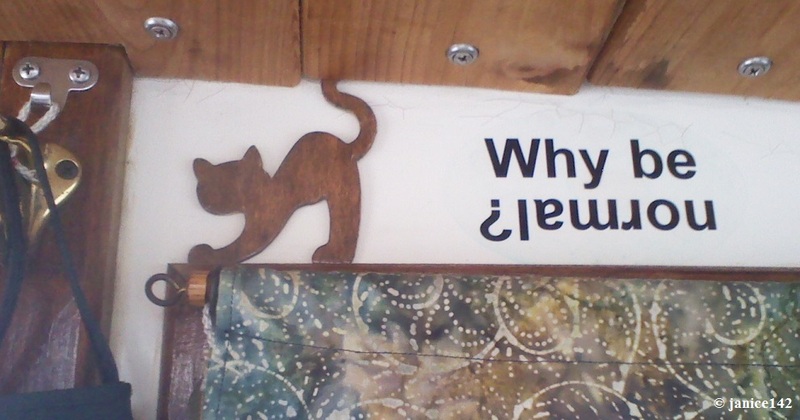 Balancing on the window frame with her tail tucked into the cypress wood overhead, the cat is a surprise find for folks who look around the boat. For me, I prefer the subtle. When you're onboard Seaweed by looking you just might see something that's right there, and has been for years. A friend, Ken on Sparrow, noticed after multiple visits the koi curtain supports and commented upon them. It tickled me that he spotted them. That's probably a girl thing though. Freebird Marsha had found the pair in a thrift store one day and ended up giving them to me for Seaweed. I love the fishy ends, even if dusting them is a pain in the transom. And yes, those of us out here do call each other by our boat's names. Pick a good name for your boat because you will be known by it. Something unique, easy to spell, and not pornographic would be ideal. I know aboard Ken's 40' sloop (a Rhodes Bounty converted from a ketch) he's got the coolest light covers near his companionway. I've tried to talk him out of them -- and his Katadyn watermaker too. Alas, no success. Not yet anyway! Every time I haul water I want that watermaker more. Sigh. 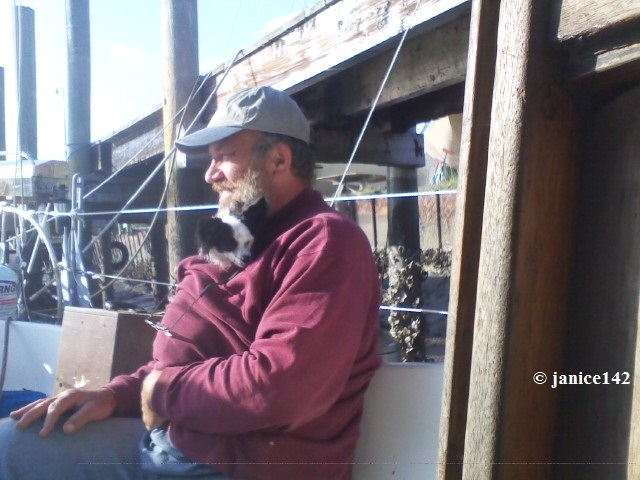 It was cold and Skipper had snuggled inside Ken's sweatshirt. One of the best parts about visiting other boats is noticing the little things that make a particular vessel unique. Any boat that's been lived aboard for a time has usually had lots of nifty modifications. I enjoy learning what others have done. By making similar modifications Seaweed improves. My home becomes better and more comfortable because of the alterations made since purchase. It's little things, but important to my happiness quotient nonetheless. 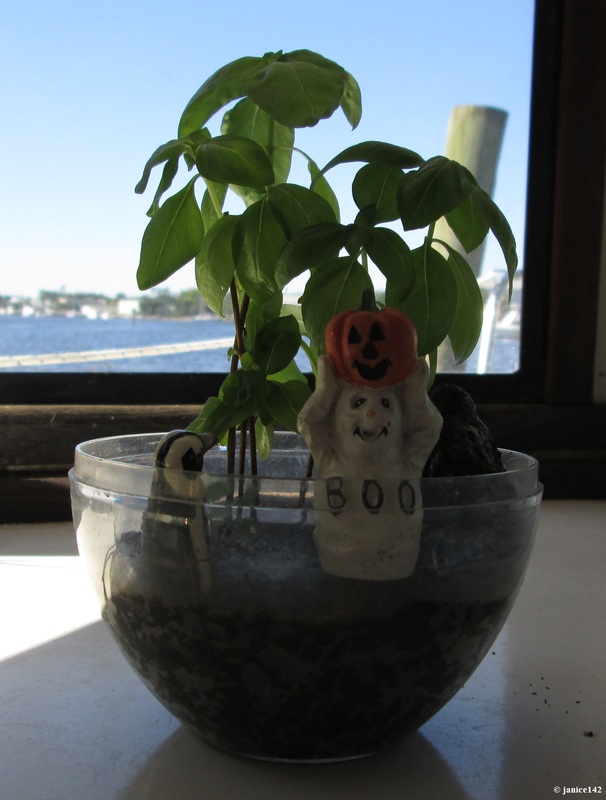 Festive basil plant with Boo sits on the pilothouse chart-table. Recently I cut back my basil plants and added one of my two Boo characters to the planter. A small penguin, a gift from my daughter, also shares the planter. Basil seems to grow without any effort and as I like greenery it brightens my pilothouse. When underway I have to move the plant to the sink or affix it with Quake Hold! Quake Hold! is a putty-like stuff that affixes items without damaging them. You can move things around but it will hold stuff put. I wouldn't trust it for a television, but for the speakers of my sound system and other light weight things, it works. And it's about $5 on Amazon. Another favorite is from decades ago. This little bear all wrapped up in bandages was bought in the Shand's Hospital (Gainesville, FL) gift shop when one of my duo was in there for testing. I loved the cheery little face so brought him home for my Christmas tree. He's hanging from one of my cigarette lighter outlets. That one is generally used for the handheld GPS power supply. 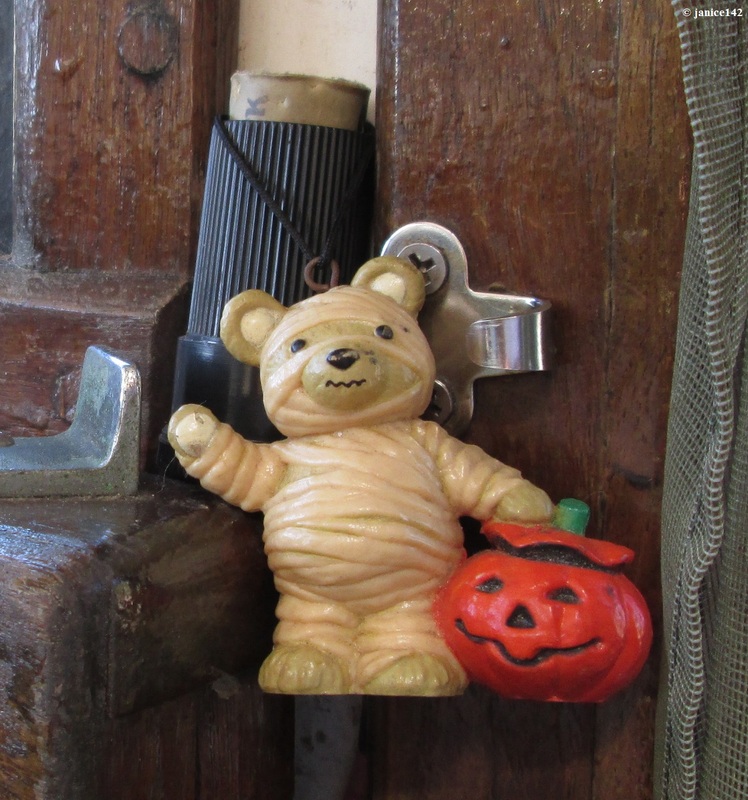 The fender hook (behind the bear's head) is part of the attachment system for a netting I put over the pilothouse doorways when underway. 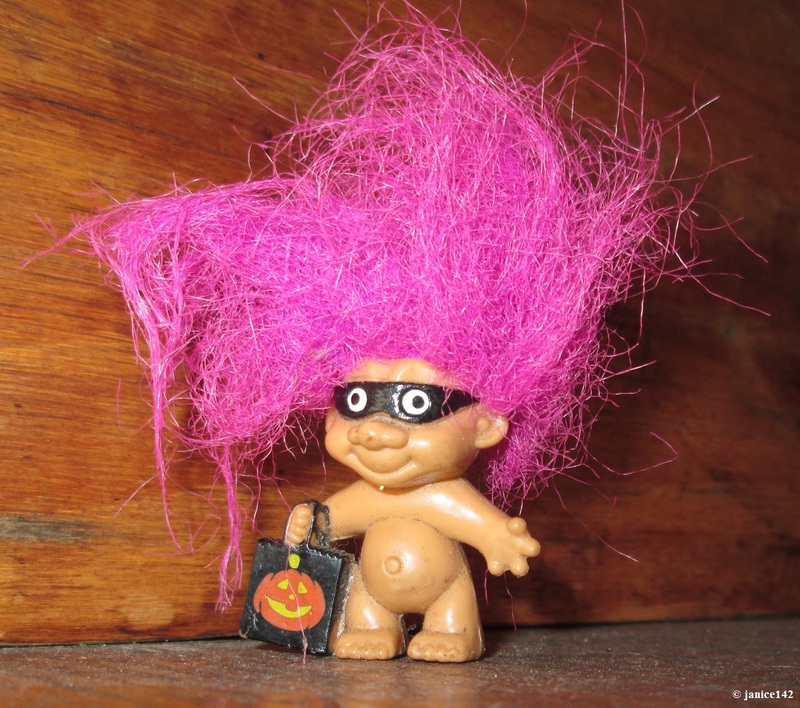 But by far, the pink troll is my favorite of late. The hair resembles mine first thing in the morning. I can imagine he's carrying a bag full of Indian Candy Corn and Autumn Mix, both by Brach's, in that bag. So far I've resisted the urge to splurge but I suspect I'll buy a package, or two, soon. Wishing you a spook-tacular Halloween from my Seaweed to your home. Aphorism Alert: People usually do what they feel like doing anyway and rationalize what they've done afterward. L. E. Modesitt Jr.